While Summer is rapidly coming to an end (my children start school this week!!!!!! ), I'm not quite ready to let go. See, here in New York our Winters can be really brutal. Lo and behold, the Farmer's Almanac has called for a really harsh Winter this year, so my death grip on Summer has gotten a bit tighter. Fall is definitely my favorite season, but I know what comes shortly thereafter so.... In my life, I have been trying to extend some Summer flavors into the rapidly approaching Fall so that I can hold as much of Summer with me as possible. One of my favorite ways to do this is with Almond Breeze Vanilla Almond Coconut Milk Unsweetened. I really love how much variety I can find with the Almond Breeze Almondmilks. From hint of honey, to the original, and now vanilla and coconut! What's great about Almond Breeze Almondmilk is that it really caters to individuals who have certain sensitivities. It is dairy-free, soy-free, lactose-free, cholesterol-free and gluten-free. Even for those without dietary restrictions, the Almond Breeze Vanilla Almond Coconut Milk Unsweetened is all-natural, contains 50% more calcium than milk, and is only 45 calories per serving. It makes it such a healthy alternative. It's also a wonderful option for those who follow a vegan diet. .I grew up drinking cows milk so sometimes the unsweetened varieties of Almondmilk take a little getting used to for me. I tend to use them in my smoothies which are naturally sweet from the fruit, or in my cereal, although, on a particularly hot day, I did enjoy a glass of the Almond Breeze Vanilla Almond Coconut Milk Unsweetened with a slice of apple pie. I really love the subtle hint of coconut that it brings to the drink. It's perfect for Summertime, and I found out one morning when I ran out of my traditional coffee creamer, that this too makes a fine and tasty replacement. I admire all of the benefits that it brings to the table, and even though I (or my family) do not have to follow any particular dietary restrictions, I am glad that I introduced this variety of milk to my children while they were still young. They especially love the Vanilla and Chocolate Almondmilks. Since becoming a Blue Diamond Tastemaker, I have come to the realization that Blue Diamond has truly outdone themselves with the fun and innovative ways they have changed the face of almonds. Don't get me wrong, I will eat plain almonds all day long. I just like the way they taste naturally, but the different flavor varieties that they offer are simply irresistible! I'll take my almonds any way.... sweet, savory, plain, flavorful. I recently had the opportunity to try 2 varieties of Blue Diamond Almonds: Oven Roasted Blueberry Almonds and Salted Caramel Almonds. As you can see, my family could not contain themselves and busted into the Blueberry ones before I even had a chance to snag a picture of them perfectly sealed. Oh well, life happens. Needless to say, the kids like them, and I'm super OK with that because not only do they have 5 grams of protein per serving and taste delicious, but it also provides a healthy dose of some very important vitamins and minerals. For example, they provide 30% daily value of vitamin E, 3 grams of Fiber, and a measly 25 milligrams of sodium. I'm happy when the kids choose these over sugar filled, unhealthy alternatives. I find the blueberry taste to be sweet and refreshing, and the perfect pair for a Summer day. Plus, they're PURPLE! The Salted Caramel Almonds are absolutely a sweet treat. When I first tasted them, I knew they would be the perfect pair with ice cream. They are perfectly crunchy, yet sweet like caramel with a touch of salt. It really feels like you are indulging in something fattening/unhealthy, so you feel guilty until you read the label. There are only 3 grams of sugar per serving! AND... they provide 20% of your daily value of Magnesium. I have no idea how true this is, and I am not a medical professional, but I have read a lot lately about the importance of Magnesium, and how almost everyone is very low in it. What a great and tasty way to boost those levels! Plus, as I mentioned before, it goes undeniably perfect with vanilla ice cream, if you have a sweet tooth like me. I suppose you could put it in yogurt if you are feeling a little healthier than myself, and Greek yogurt if you are feeling uber-healthy. My goal is to eventually try every almond variety that Blue Diamond has to offer. Next up on my list is the Wasabi and Soy Almonds. I have heard all good things, so I need to try them for myself. My favorite to date are the Sriracha Almonds. Do you have a favorite Blue Diamond Almond flavor? If so, let me know in the comments! If you want to explore all of the flavor options, you can do so right on their website, and then even find where you can buy them at your nearest retail location! Check it out HERE. Tubby Time For the Littles! I tend to be a pretty laid back, non-picky person about most things in my life. That being said, I am very particular about what products I will use on my children. My daughter has battled with eczema since she was an infant, so using gentle yet effective products are absolutely essential. Its my personal preference, but I really like to use organic body washes, shampoos and conditioners on my kids because I feel they are safer. I don't judge anyone for using conventional brands because I've done that in the past, and also because it's much more cost effective. I love that there are some new brands that are creating more affordable products for our families that use safer ingredients. One such brand is Gaia Organics, and I'm excited to say that we are currently using their All Natural Baby Shampoo and Body Wash. The Gaia Organics Baby Shampoo and Body Wash comes in a relaxing Lavender scent which is perfect for your little ones nighttime routine. I think I saw it in a commercial, which stated that babies who have bedtime routines that include lavender scented products are more likely to experience a better nights sleep. Both of my kids are good sleepers at the ripe ages of 3 and 10, but I don't think a mother ever forgets what sleep deprivation feels like. Lavender is known for it's calming properties, so it certainly can't hurt! What is impressive is the short list of ingredients on the back of the bottle. What you WON'T find in the bottle are all of the nasty ingredients that you don't want touching your children's sensitive, new skin, including: sulfates, parabens, petrochemicals, preservaties or additives. We've had a great experience using Gaia Organics Baby Shampoo and Body Wash. First of all, the scent is very faint and of natural lavender, so even if you or your child are bothered by scent, I really don't think this would be an issue. I love that the product uses natural and organic ingredients, and is made right here in the good old U.S. of A. The bottle could use a little change, and mainly because the formula is very watery. I wish this has a pump top versus a pop open and pour top because it can become difficult to dispense the product, or dispense the right amount of the product. Speaking of which, figuring out how much you need to use can have a bit of a learning curve. I cannot complain that the product itself is watery because many natural products are, and many do not lather either. I found that this did lather, but I needed to use more product than I would have lie to get that result. I really wish this came in a larger size because I feel that we will run through this quickly. Nonetheless, the product does clean my littlest lady, while leaving her skin soft and supple. I still have to use conditioner in her hair because it is super long, but this works well to clean her hair too. I'm definitely most drawn to the ingredients used in this product above all else though. If you are interested in this shampoo and body wash, or know someone who may be, you can purchase it from Amazon for $10.49. I know we still have some Summer left, and I am far from wishing it away, but I also know that the cooler weather is right around the corner, and I need to prep my skin for it. I despise dry skin. I especially hate when my hands are dry. It gives me the heebie-jeebies just thinking about it. I like to keep lotion out around the house to ensure myself, and any guests, don't ever have to deal with the nuisance of dry skin. I recently tried out a very innovative lotion that has quickly made it the answer to my dry skin needs. It is called Adamia Therapeutic Repair Lotion. Adamia was born out of the desire to heal hurting skin, and a tree. The Macadamia tree holds the macadamia nut, which holds one heck of an oil: Macadamia oil. What's so unique about Macadamia oil? The fact that it's oil is very similar to the oil our own skin produces, makes it incredibly easy to penetrate our skin and get to work. Adamia has created their own exclusive blend of Macadamia oil that is rich in Omega-7 (called Promega-7) which boosts moisturization while also healing irritated, broken skin. Their formula promises to deliver exceptional absorption, while being fragrance-free, paraben-free, gluten free, cruelty free, petroleum free, soy free, non-greasy, non-allergenic, non GMO, vegan and clinically proven to improve distressed skin. 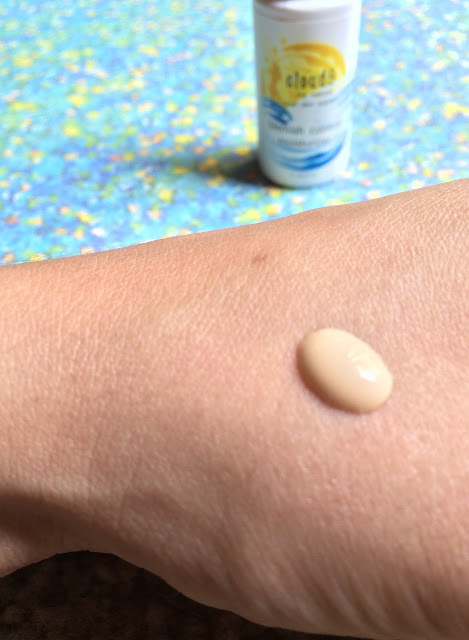 This works really well with older individuals as their skin becomes thin and easy to tear. It comes in a generously sized 16.9 fl. oz. bottle with an easy to use pump top dispenser. I really love this Adamia Therapeutic Repair Lotion. It leaves my skin feeling like silk. There is no exaggeration that this is very quick to absorb, which I love because there is nothing like a lotion that you have to rub and rub and rub and rub and rub and rub in. Many natural lotions use coconut oil and shea butter in their ingredients which can leave your skin feeling a little greasy until it completely absorbs, but this does not. While I normally love lotions that are scented, I am so obsessed with this formula that it doesn't bother me one bit that it has no fragrance. I use this so much that I keep it out on my front table so everyone has access to it. I know this will come in handy during the Winter months when I wash my hands every 5 seconds and the skin around my knuckles gets so dry it cracks and peels. While I mainly use this on my hands, it is intended for full body use, although they caution not to get it in your eye area. I mean, our eyes don't need lotion anyway, so I'm good with that. If you're interested in such a soothing, healing, fast-acting lotion, I would definitely recommend the Adamia Therapeutic Repair Lotion which can be purchased on Amazon for $18 - a totally reasonable price for the size of the bottle! You can follow the brand on Facebook, or check out their website to keep up with them too! I have a skincare regimen that fluctuates often because I always have so much stuff I need to try out for review purposes. I'm not complaining either! I have found some of my absolute favorite products throughout my experimentation. Nonetheless, I always try to review products that are relevant to my skin type and my skin concerns. This also tends to change with season. During the cooler months I load up on hyaluronic serums and moisturizing creams, and during the warmer months I use lightweight moisture, vitamin c serums and lots and lots of SPF. One thing I am always combating is acne. No matter the season it is there, and I am fighting the never ending battle of getting it to go away for good. I recently tried Cloud 9 Blemish Control Moisturizer, and it's really helped me with my persistent cystic acne flare ups. Cloud 9 Blemish Control Moisturizer was created to provide a natural alternative to harsher chemical treatments for acne. They claim that their product can help to clear breakouts, balance oily skin, moisturize, soothe irritated skin and dissolve hard sebum bumps. They use 2 natural ingredients that help to achieve these results through inhibiting hormonal triggers, destroying acne-causing bacteria, halting excess oil and sebum and refueling Vitamin F deficiency. 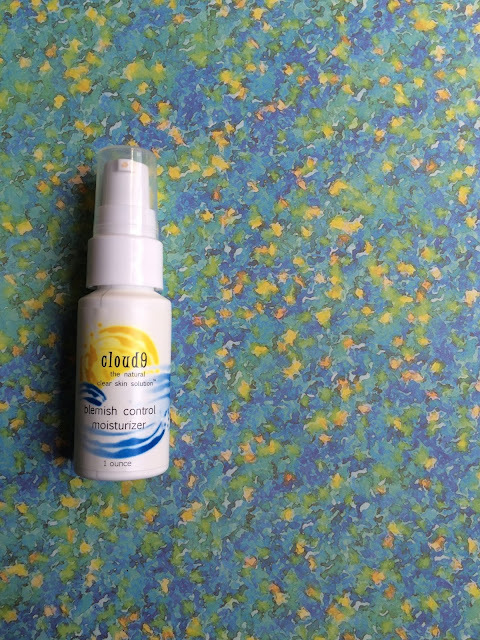 The Cloud 9 Blemish Control Moisturizer comes in a convenient pump-top bottle, and in two sizes: 1 fl. oz or 1.6 fl. oz. Their patent pending ingredients read as follows: purified water, passiflora incanata, carthamus tinctorius, camelina sativa, butyrospermum parkii, citrullus vulgaris oils, sucrose stearate (from sugar), epilobium angustifolium extract, elaeis guineensis mesocarp oil, glycerin, essential oil blend, copaifera officinalis resin, carapa guaianensis seed oil, euterpe oleracea pulp. lonicera japonica, lonicera caprifolium extracts, phyllanthus emblica fruit extract, hyaluronic acid, tetrahydro curcuminoids, ferulic acid, dipotassium glycyrrhizinate (from licorice root), camellia sinensis (green tea)extract, xanthan gum, guar gum, maltodexrin. I've tried it all, so I can attest to how harsh some treatments are. Using other treatments would cause my skin to become very dry and peel or flake. Because this is not a "system" like some other acne products, I did not expect it to irritate my skin, and it didn't! I use this twice per day after washing up and applying toner and serum. What's convenient is that this works as a 3-in-1: cream, spot treatment and moisturizer. I use one pump (about the amount pictured above), and that is enough to cover my face. The Cloud 9 Blemish Control Moisturizer is quick to absorb, non-greasy and non-comedogenic. The scent is a bit strange, and I can't quite put my finger (or my nose) on what it smells like - It's like fresh cut grass and something else. It doesn't linger though so it is entirely tolerable. I will say that my cystic acne has been less severe since starting this, and I'm so thankful for that because it is very, very painful. My only other complaint is the high price tag for the amount of product. Luckily, a little really does go a long way. If you are interested in a light-weight moisturizer that works hard to combat your acne naturally, you can purchase this on Amazon for $20.99. What Do Showers and Blueberries Have in Common? One of the most important step of skin care is exfoliation. Disgustingly enough, our skin cells die quite often, and exfoliating is what keeps your skin looking gorgeous despite that. In order to keep your skin looking bright, fresh and youthful, you ave to slough away the gunky build-up that makes it entirely dull and boring. So what makes a good body exfoliant? It truly depends on your skin type and the results you are looking for, but for the most part, an exfoliant should contain some kind of abrasive ingredient to do the exfoliating, and then other ingredients that collaborate to deliver your desired results. I recently tried Jaowying Blueberry Body Scrub, and it's really a great gentle Summertime body scrub. Jaowying uses a unique blend of ingredients to make their blueberry scrub high in anti-aging and nourishing properties. First up is Niacinamide, or Vitamin B3. Niacinamide is known for its ability to improve the elasticity of the skin while also toning and reversing discoloration. Next is Vaccinium Corymbosum Fruit Extract which comes from blueberries! This is very high in antioxidants and has been proven to boost anti-aging capabilities. Hence the reason it's good to eat our blueberries, and scrub with them too! This scrub also contains Vitamin E which has been celebrated for its ability to heal, but when applied topically (versus taken orally), it also has the ability to combat fine lines, wrinkles and age spots. And lastly, Juglans Regia Shell Powder, or in simpler terms, walnut shell powder. Aside from assisting skin's elasticity, it also increases circulation, which means all of the oxygen in your blood gets brought to the skin, giving it a natural appearance and glow. Their formula is a creamy texture with tiny scrubbies throughout. When it comes to exfoliation, for my skin, the more abrasive, the better. I mean, I don't want to wash up with shards of glass, but I need it to plow through the dead skin cells to reveal what's hiding underneath. I feel like I have really fast cell turnover or something. Like, I could totally exfoliate every single day and it would not irritate my skin whatsoever. That being said, it's typically recommended to do it twice a week. I have been using this a couple of times per week to keep my skin looking Summer fresh and it seriously does make a difference in the texture of my skin immediately after using it. It reminds me a bit of an in-shower lotion almost, because it leaves this silky layer of smooth behind. It smells really good too! As far as being a scrub, this is a gentle scrub for sure. It won't leave your skin irritated or sensitive, but will leave your skin feeling softer than before. The jar of Blueberry Body Scrub is 5 fl oz so it will not last forever. I found that I had to use quite a bit per use, and I even kept it to just my legs. I could foresee this lasting about a month or a month and a half depending on how sparingly you use it. I also think it would be convenient in a squeeze bottle. Normally I don't think of a scrub that way, but as I said, this one is very much like an in-shower body lotion, and I feel it would serve well in a tube versus a jar. If you are in the market for a luxuriously gentle body scrub, you can purchase this on Amazon for $15. We have been very fortunate with the weather so far this Summer. Not too many rainy days, not too many scorching hot days.... it's kind of been perfect (knock on wood). My kids would rather play outside than do anything else. Believe me, I have to bring their food outside just to make sure they are eating anything other than popsicles. That being said, on the rainy days, I need to keep them busy so they don't go stir crazy. I've been saving a couple of really unique building sets from Think Fun for them to use on those days. I tried two different sets, the Maker Studio: Gears Set and the Maker Studio: Winches Set. Think Fun is a brand which creates unique toys and games for children of all ages to enjoy. The Maker Studio sets are building sets intended for use by those ages 7 to adult. These are great for the "thinkers" and the "builders" (think Lego extraordinaire), as they were created by engineers! Each set comes with a multitude of pieces used to create a few different things. The Gears Set comes with picture instructions on how to assemble a race car, a cable car, a three wheeler and a motorcycle. The Winches Set contains picture instructions for how to make a tow truck, a jeep, a well and a crane. Plus, each set also comes with a "challenges" book intended to teach kids different concepts such as friction, torque and propulsion. This is the perfect rainy day activity to do if you have kids that are 7 and up. I will say that my 3 year old wanted to be very involved in this, but there is no way she would have the patience and ability to follow the instructions. That being said, I would totally allow her, supervised (due to small pieces), to play and create something on her own with this. First things first, all of the pieces come bagged inside of the box which is like music to my ears, or a box of cookies to my tummy. I'm always frustrated by toys that come loose in a box, because how often do you want to keep the box around? I end up bagging things on my own, so the fact that the pieces came in reusable zip top bags was a hit with me right off the bat. The instruction books are in color and have some explanation in the beginning followed by picture instructions for each building exercise. I think it's much easier to show versus explain with this particular toy, and I found the instructions a cinch to follow. My 10 year old was able to understand the instructions with a bit of guidance as it was sometimes difficult to tell which order to put the pieces together in. The assembly itself, depending on which item you choose to build, ranges from pretty easy to rather intricate and a little harder. For example, from the Maker Studio: Gears Set, we built the motorcycle. It took about 20 minutes total, but only because we had to trace and cut out the motorcycle frame outline. From the Maker Studio: Winches Set, we built the tow truck, which had a bit more to it, and probably took a good 30 minutes or more. Our only frustration when building was the black rubber pieces. They are like the "glue" in that they hold everything together, but are very hard to move along the long rods. It ends up being an even trade-off because they make the structures sturdy even though they require some finagling up front. I also appreciate that you can get so much from each set, as they build more than one gear/winch, and that these sets go a step further to include challenges to demonstrate and teach more about the structures and what force they have. These sets retail for $19.99, which is very reasonable, and you can find them on Amazon (Gears/Winches). Everyone has a "junk drawer" in their house right? It's not just us? We have a drawer, or maybe it is a couple of drawers throughout the house that hold the miscellaneous items. You know, the items you sweep off the table when guests come over, the random broken pieces of toys you keep because you know if you throw it out it will be the piece that makes such-and-such toy actually work, and random papers from who knows when that you saved for who knows why. Regardless, they get thrown into the junk drawer and there they reside until you go in there once a year, realize you haven't used any of that stuff for a year, and then throw it all out. Well, up until recently, our batteries used to reside in the junk drawer. Eventually we saw what a catastrophe that was, and we bought a plastic bin to keep the batteries in. This temporarily helped because we knew where all the batteries where, but it provided zero organization to the whole process. Then came the Kovot Battery Organizer. This thing is GREAT! If you are any shade of OCD, you will see this and need it in your life immediately. Seeing your batteries organized and accessible will bring pure joy to your heart. The Kovot Battery Organizer holds a total of 72 batteries, including AAA, AA, C, D, 9 Volt, CR and AG13 Button Cells. It's quite comprehensive! Not to mention, you can lay it in a drawer, or it comes with hardware to mount it on the wall. The organizer itself is a decent size (obviously it has to hold batteries, even the big ones), with these dimensions: 1.4 x 7.2 x 1.8 inches. Aside from storing all of your batteries in one place, it also has a tester on them. So, when you find a random battery floating around, you no longer have to wonder if it is any good, or needs to be recycled. In the upper left and corner of the Kovot Battery Organizer there is a tester with 3 ports. Port A is for testing the 3V Button Cells, port B is for the AA, AAA, C and D batteries and port C is for the 9 Volt batteries. In my experience, this thing has been great. It actually fits inside of the bin we were using to store our batteries, so I haven't even had a reason to mount it on the wall, although I kind of want to mount it on the wall in the little closet in our back room so it's even more accessible. Aside from keeping our batteries all in one place, the things that I love the most about this is the battery tester. You have no idea how often I find random batteries laying around the house. And quite frankly, I have no idea why either. Anywho..... now, when I find them, I can test them to see if they are still any good, or if they are dead. As you can see, the tester is very easy to use too. Initially it took me a second to figure it out, but once I realized the top part opened so that you had metal toughing each side of the battery (for all but the button cells and 9 volts), I was good to go! When you see the tester it is obvious where the button cell and 9 volts are tested. If you are looking to organize and keep track of the batteries around your house, I highly suggest you purchase this organizer! You can find it on Amazon for only $12.99! I'm not sure what has sparked this amber-necklace-wearing-toddler trend, but I love it! I feel like little kids love to wear jewelry, and what better than to find something cute AND functional that doesn't look hideous? Now, I realize that people are very torn over this. Some people believe it is a bunch of shenanigans, and other people swear that the only way they got their little ones through the awful stages of teething was via an Amber Teething Necklace. I have tried a couple of them now, 3 to be exact, and I love them! We recently tried one from Baltic Wonder, and we really like it! The whole craze around Amber necklaces is that the Amber holds something called succinic acid, which has been used in the past as an anti-inflammatory. When worn around the neck, wrist, ankle, skin in general, the skin heats up the amber bead and releases the succinic acid into the skin where it heals. Therefore, it is suggested that babies who wear this necklace will reap the benefits, and be pain-free in the teething department. As I mentioned before, moms across the nation are torn on this subject where some claim these do absolutely nothing, and others say it was the life changing solution to teething for their children. I'm not here to debate the topic. My kids are through with teething, and for the most part I just love the way they look, and the fact that they are natural. Excuse whatever is on her teeth.... just look at the necklace! The Baltic Wonder Amber Teething necklace comes in a nice little bag with a certificate of authenticity. I am very grateful for the bag because the first Amber Necklace we ever had I lost, and still have yet to find it. It boggles my mind because I have no clue where it has gone, and I'm convinced it has run away with the missing sock pairs, my hair ties and likely my sanity too. Needless to say, having a bag to keep it in makes it much less susceptible to loss, and for that, I give it two thumbs up. This necklace is 33 cm long, and as you can see wears pretty loose on my three year old. Sometimes they are a little tighter, and so long as it doesn't become a choker, I have no preference. Amber necklaces tend to be hand crafted, and are knotted after each bead, meaning if it ever does break, you won't lose all of the beads. Plus, the necklace screws together in the back so you never have to worry about faulty clips or anything breaking. It's very sturdy, looks cute and makes my daughter feel like a princess. What's great is that these are unisex too! Baltic Wonder also provides a 1 year guarantee with this necklace, so you have nothing to lose! If you are interested in trying out this necklace, you can purchase it for the current price of $16.99 on Amazon. I've suffered with acne since I was a teenager. I really feel like the better part of my life has been littered with having to combat acne, because lets face it, it's gross. I've tried a number of different things from prescription creams, to prescription medications, to systems aimed at clearing acne and even natural methods. Some have worked better than others, and for the most part I have shied away from prescription anything because I just don't trust the motives of large pharmaceutical companies and brands. For the most part, I just deal with my acne and buy expensive full-coverage foundation that will cover it up. Since becoming an adult, my acne has turned more hormonal in nature, which results in large, cystic acne that resides mainly on my chin. It's painful and lasts longer than your average "whitehead" because it's under the skin, and can't be popped. Today I will share my experience with an acne system that I recently tried out by Neutralyze. As you can see, Neutralyze is a 3 step system, designed to last for 30 days. Step 1 is the face wash, which is a creamy wash formulated to rid your face of dirt, oil and bacteria without stripping your skin of it's natural moisture. Step 2 is the spot treatment which combines 1% salicylic acid with mandelic acid (an aha derived from almonds) to deliver a one-two punch, as it eliminates current acne while also providing healing to the skin through dead skin cell removal. And lastly, step 3, the synergyzer, which corrects the pH balance of skin, helping it to heal faster. When used correctly, this system claims to correct, heal and prevent acne vulgaris, gently. When using this system, it is essential to use it correctly. First, you wash your face with the face wash, pat dry and apply the spot treatment. After that, it works best if you wait 5-15 minutes to apply the synergyzer. After that, you should wait another 5-10 minutes before you apply anything else (moisturizer, sunscreen, make-up, etc). In my experience, this system has been ok. I get hormonal acne, so around that time of the month, my face will have a break-out session that tends to clear up just in time for it to happen again. Since using this I have found that my break outs tend to clear quicker, but they definitely have not gone away. Luckily, I have enough of the product to continue using it to see if elongated use increases it's effectiveness. Sometimes I have an issue with ditching something before I've given it a fair shot, but this I am going to continue using. Essentially, my acne did not form overnight, so I don't expect something to cure it overnight. The cleanser is a milky colored cream cleanser. I normally use about a dime sized amount of it when I wash my face. It lathers nicely, and has a very neutral smell, like a regular bar soap. I find that it does a great job at taking my makeup off, but if you have any doubts I would remove makeup first, and then proceed with the wash. The spot treatment is the blue-ish one, and it smells heavily of alcohol. Like, I could use it under my nose if ever I thought I might pass out. That being said, it sinks in and dries super fast, but does not leave your skin feeling robbed of any moisture. After applying that I will brush my teeth or blow dry my hair, do something to pass the 5-15 minutes before I apply the synergyzer. That has no scent, and brings a little tingle to your face as it promotes circulation. Then I find something to do for another 5-10 minutes before I apply my moisturizer. This system is time-consuming, and would be tricky to use for someone that finds themselves with little time to fit in the 20-30 minutes it takes to complete all steps. What I love most about this system is it's gentleness. Every other time I have used a system or a product aimed at eliminating acne, it has dried my skin out terribly! During the Summer, my skin is more normal versus dry, so I was so happy that this was non-irritating, and did not bring my face back to the desert it becomes in the Winter. I will continue to use this system until it is gone. While it is marketed as a 30 day supply I have been using it close to that and still have 3/4 of it left. I only use a very small amount of each of the products, so even though the containers are small it doesn't last any less time. Once this is gone I will contemplate re-purchasing. If you struggle with acne and wish to combat it with gentle ingredients, I would definitely recommend giving Neutralyze a shot! You can find it on Amazon for $39.95 for a 30 day supply.